We have an exciting opportunity to build great cities and towns in our region by making bicycling safe, convenient and fun. This is not about thinking bikes are cool and its not about weekend exercise and recreation in our beautiful parks and open spaces. Though those things are good too. Making bicycling safe, convenient and fun for everyday transportation brings tremendous advantages – it allows families to be healthy and save money on transportation, makes more vibrant and connected communities, and supports our local businesses by helping them attract customers, retain talented staff and attract tourists. In the modern competition between cities for talent and business, our region’s superior advantage could be lifestyle and active living. Today young professionals and CEOs are drawn to live and raise a family where they can lead an active lifestyle and appreciate the outdoors. They want to be able to do so in their daily lives, not just on the weekends. “I moved my start-up business there in the first place, for lifestyle reasons“, said Peter Barth, the keynote speaker at last month’s Shasta Economic Development Corporation event. That was the initial attraction. And then he and other CEOs and community leaders built an amazing start-up incubator and developed new firms and built jobs that have re-vitalized the city of Greenville and the local region. In Walkable City: How Downtown Can Save America, One Step at a Time longtime urban planner Jeff Speck writes: “The conventional wisdom used to be that creating a strong economy came first, and that increased population and a higher quality of life would follow. The converse now seems more likely: creating a higher quality of life is the first step to attracting new residents and jobs.” Interestingly, the Association for Convention Management finds these ideas compelling. Safe and inviting sidewalks and bikeways bring people right past the doors of retail businesses. Thus the previously well-recognized power of foot traffic is again appreciated by businesses that have found themselves on fast-moving street corridors where people say, “I had no idea that business was there”. Mounting evidence from cities that install protected bikeways to serve business districts shows retail sales increasing, sometimes dramatically. “There is a strong connection between biking local and shopping local. That’s why many merchants incentivize residents to bike to their districts to shop and dine,“ says April Economides, Business Consultant. In addition, trail-based tourism can be a major economic driver. 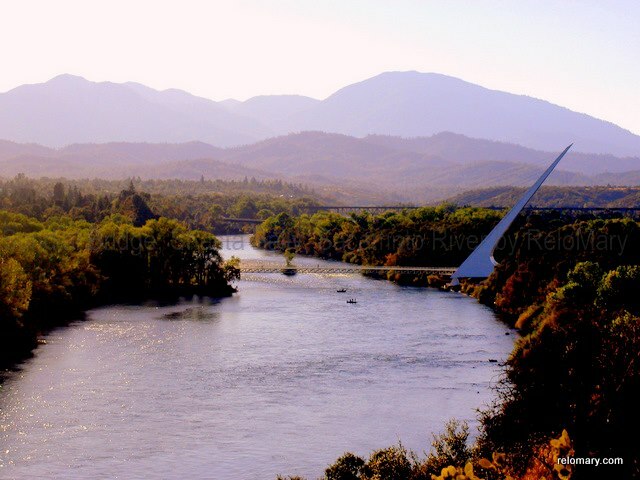 Our local visitor’s bureau has figured this out, you may have noticed the billboards on I-5 that entice people to Redding now prominently feature a bicycle. The Sacramento River Trail was recently chosen one of the Top 10 Trails in California and was featured in a national magazine. If we can build safe and inviting connections from our trails to downtown and other business districts there are tremendous opportunities for entrepreneurial businesses to develop around visitors who arrive throughout the year. 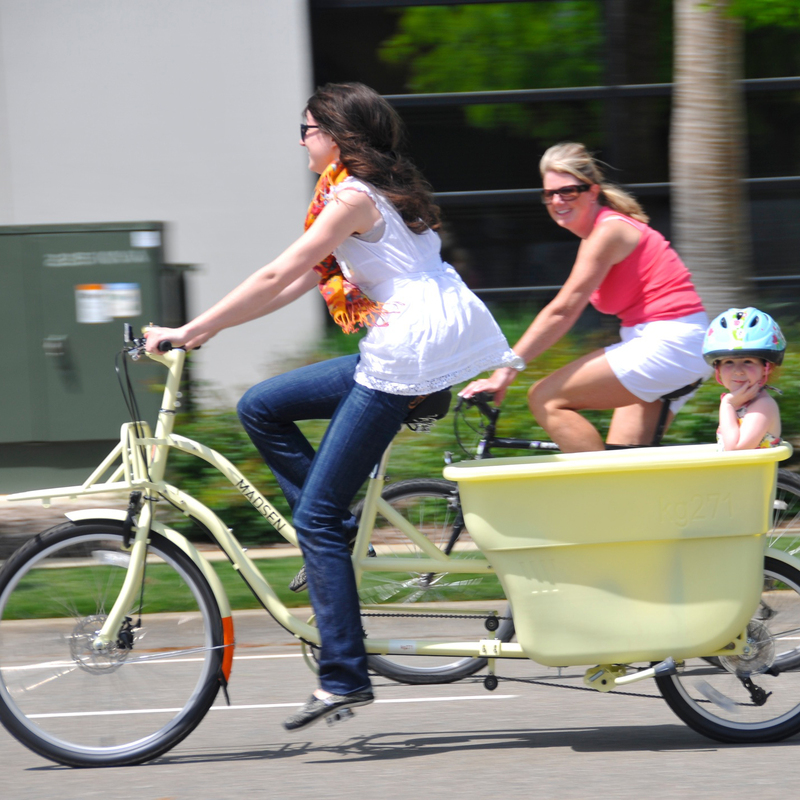 Bicycling in the United States is a $6 billion national industry and one study estimates that the spillover effects of recreational bicycling alone could be as large as $133 billion. When we create safe space for biking in our neighborhoods we allow families to save money, spend less time driving, and improve the health, confidence and school performance of children and teens. Car ownership costs are the second largest household expense for families, with the average household spending almost as much on their cars as they do on food and health care combined. 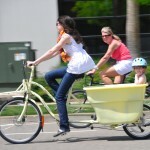 Americans using bicycles save billions, so says Forbes. We can make a big difference in the ability for our kids to be active everyday if we make it safe for children to walk and bicycle to school. The Safe Routes to School Partnership reports that just 13% of children ages 5 to 14 walk and bicycle to and from school, with 43% making the trip in a car even though it’s less than a mile to get to school. A growing body of evidence suggests children who are more active are not only healthier but also do better academically. Bicycling facilities on the roadway are relatively easy to implement and low cost. For example, the estimated replacement cost of the entire interconnected bikeway network in Portland is equal to the cost of one mile of four-lane urban freeway. Bicycle commuting helps lower civic costs by reducing the number of cars during commute times, thus reducing the need for costly road and intersection projects directed to reduce traffic congestion during peak travel which occurs only a couple of hours per day. Also, the addition of protected bike lanes has been shown to improve safety and overall road functionality: all traffic crashes decreased by 34%, commercial loading hours increased by 475%, speeding decreased, and traffic flow remained similar. People are made to move. The less we sit still the happier we are. While a treadmill desk is not for everyone, adding a bicycle trip to our daily routine makes us trimmer, boosts our mood and helps us feel more energized. One of the great things about bicycling for everyday errands is that it doesn’t have to feel like exercise and you still receive the benefits. 40% of trips are two miles or less, and a person on a bicycle going an easy speed can travel that distance in 15 minutes. 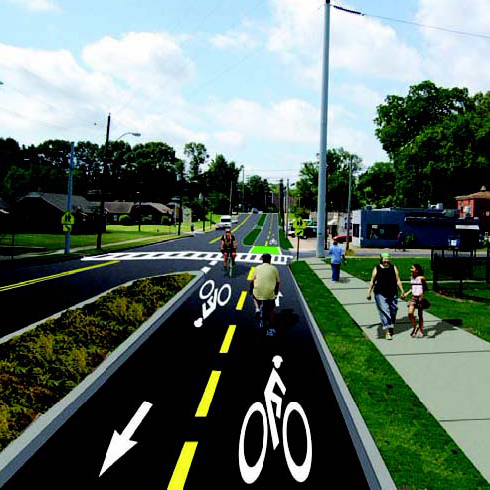 People love walking and biking on the river trail and say they want to do the same with their families for daily errands but they don’t feel safe on neighborhood streets. Imagine what it could be like if we had bikeways and greenways connecting our neighborhoods, schools, business districts, and parks. One of our greatest public assets is the interconnected network of streets and public places that binds our homes, schools, businesses and parks. We have an opportunity to create space on these roads to make bicycling and walking safe and convenient for all people, ages 8-80. This will add value to adjacent land, neighborhoods and business districts. When we couple superior facilities for active transportation with our existing world-class recreational attractions – we will ensure our region excels as a destination for families, businesses, tourists, and dare we say – conventioneers. By working together to make this happen we can generate real collective impact with benefits across our communities. Photo credit: Thank you to Mary Lascelles, The Green Lane Project, and Jeff Worthington.